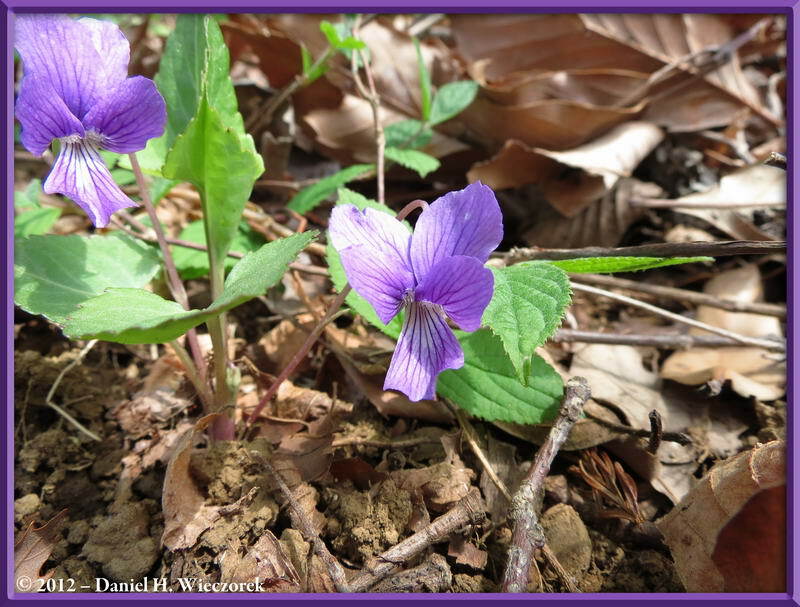 This is Page 2 of 4 - the best of April 2012! 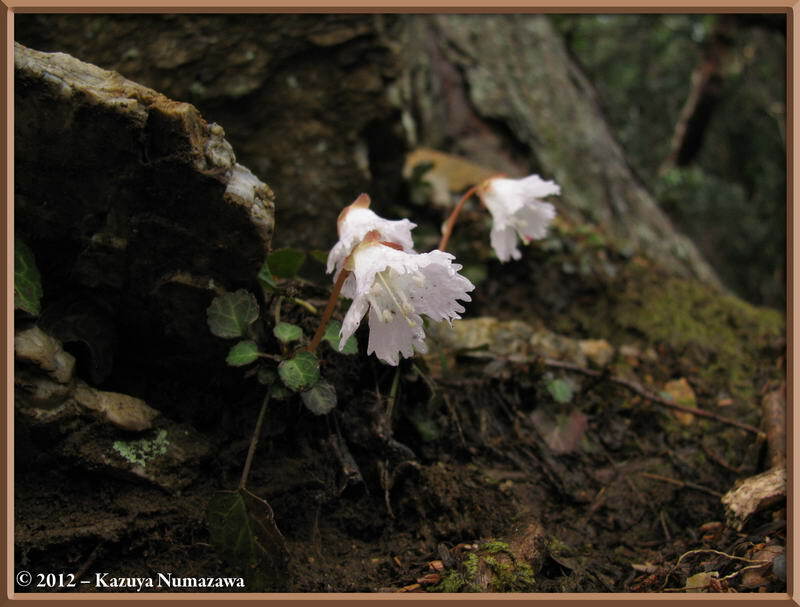 This page begins with April 13th and a trip to Minami Takao - or the South side of Mt. 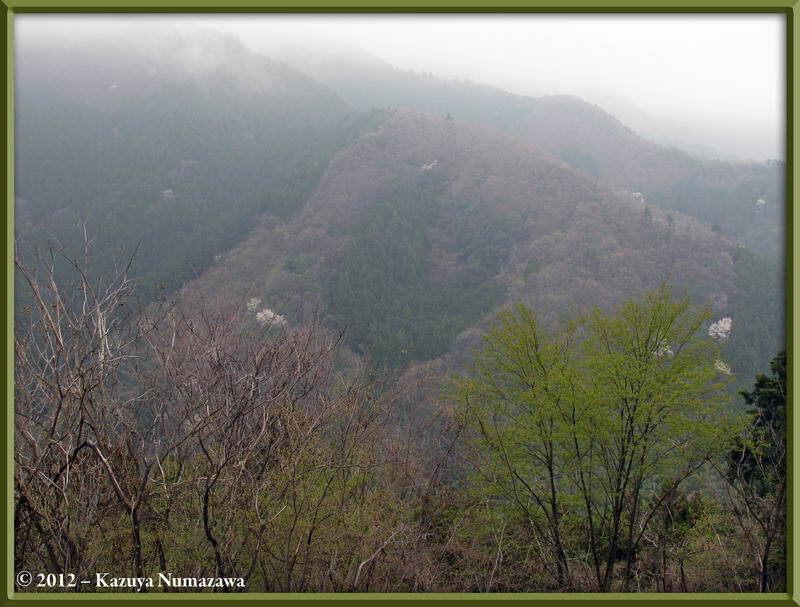 Takao - a side of Mt. 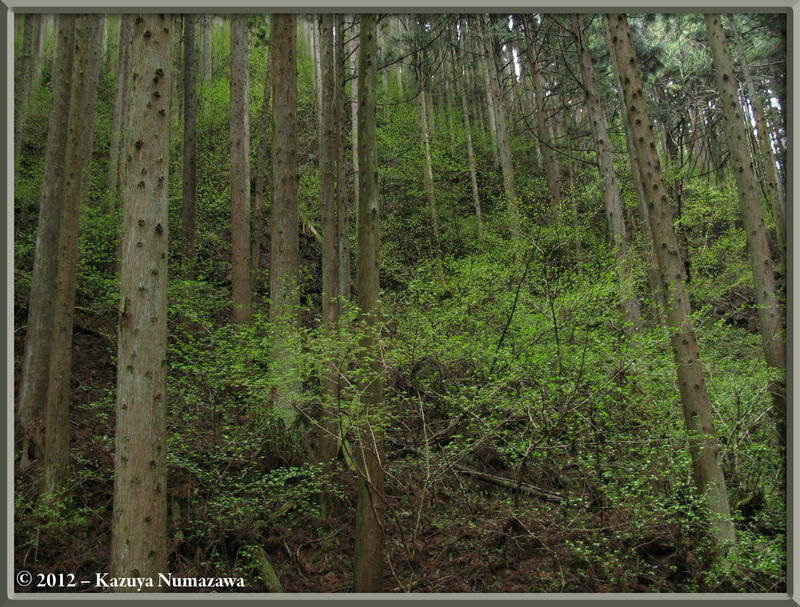 Takao which we had never visited before. 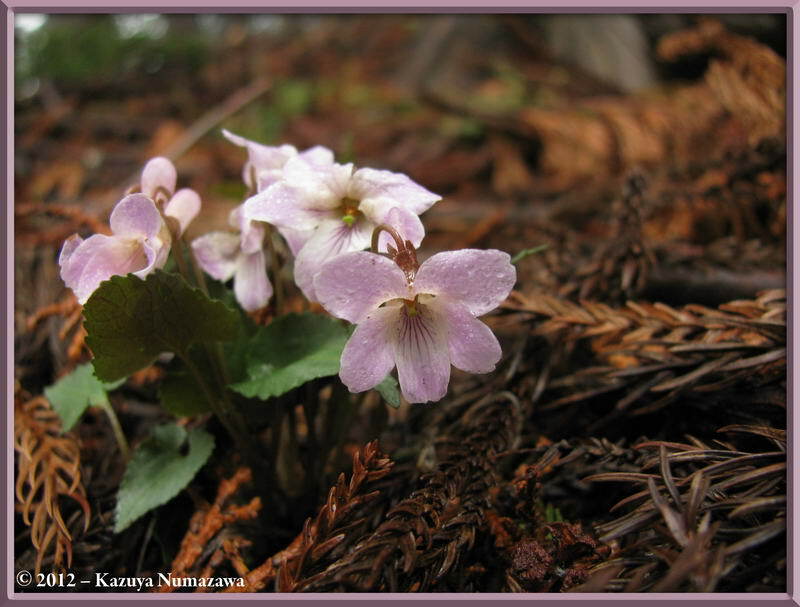 Then, on April 15th Kazuya went out to the Mt. Mitake Area and I did not go along because I was busy packing and preparing for a week long English Class to a faraway place. 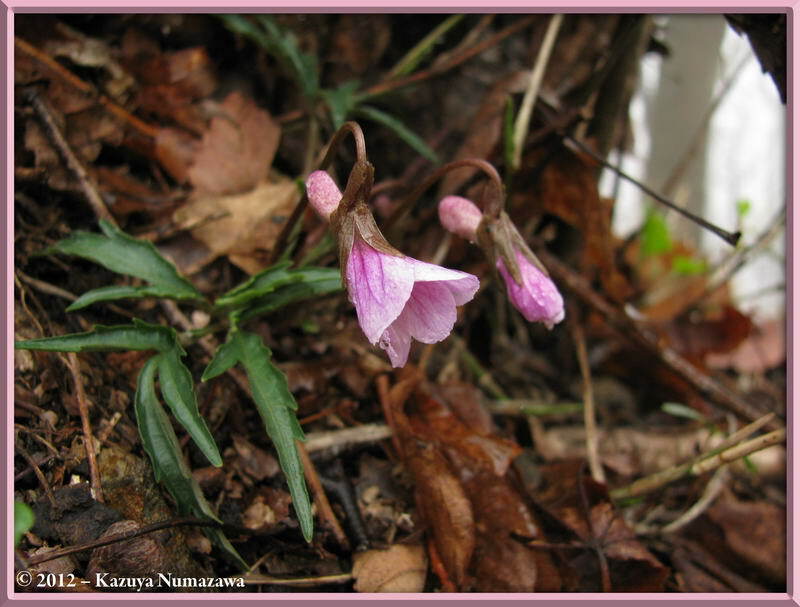 Then, on April 20th I was still away from home and Kazuya went out to another new place outside of Tokyo. That will end this page. Click on any thumbnail to begin. 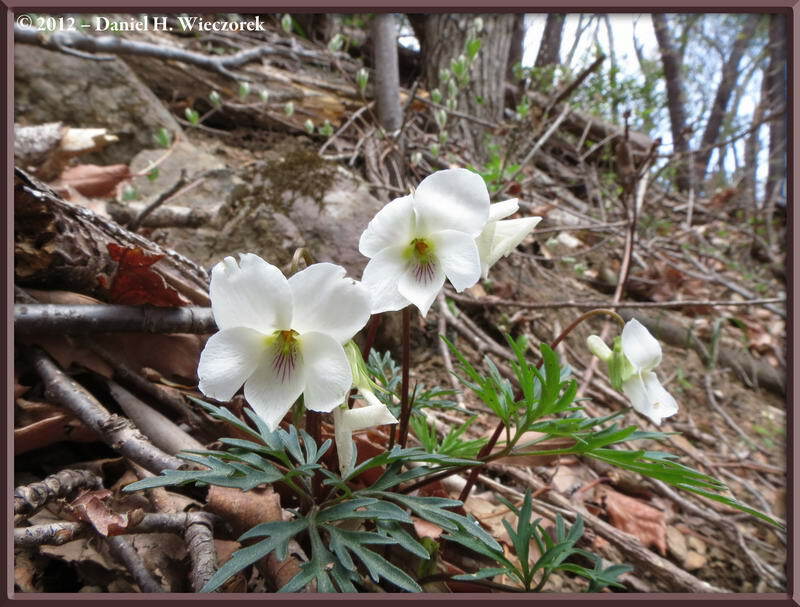 Well, as it says in the header, on April 13th we went out to the South side of Mt. 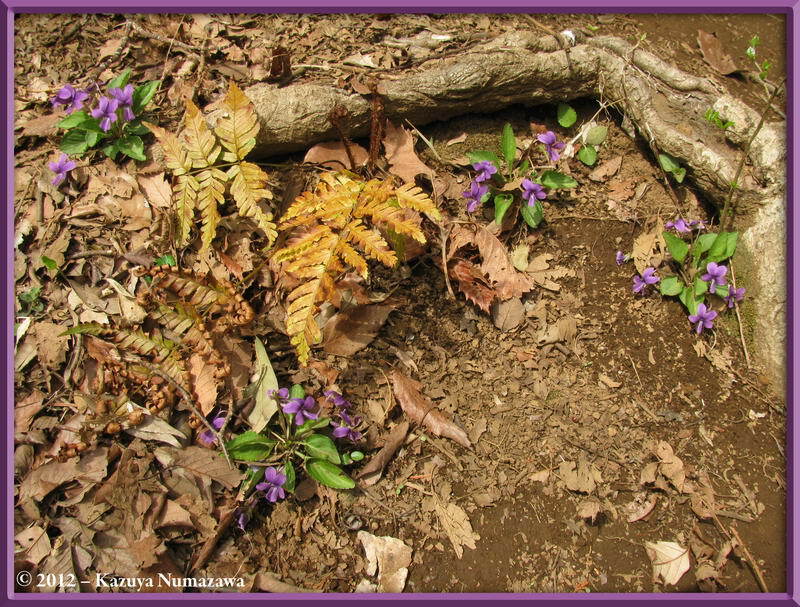 Takao - a place we had never been to before - at least not together. Kazuya had been there once before, however. 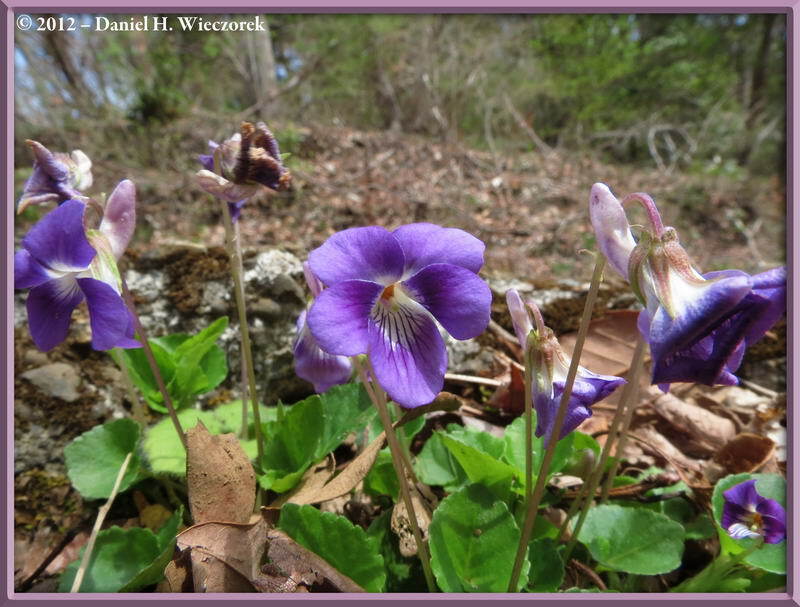 The first shot in this row shows a very nice Viola grypoceras f. variegata. 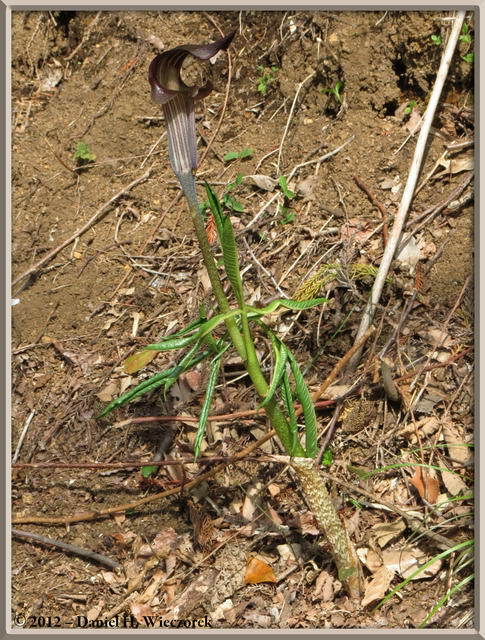 The 2nd shot is an Arisaema sp. 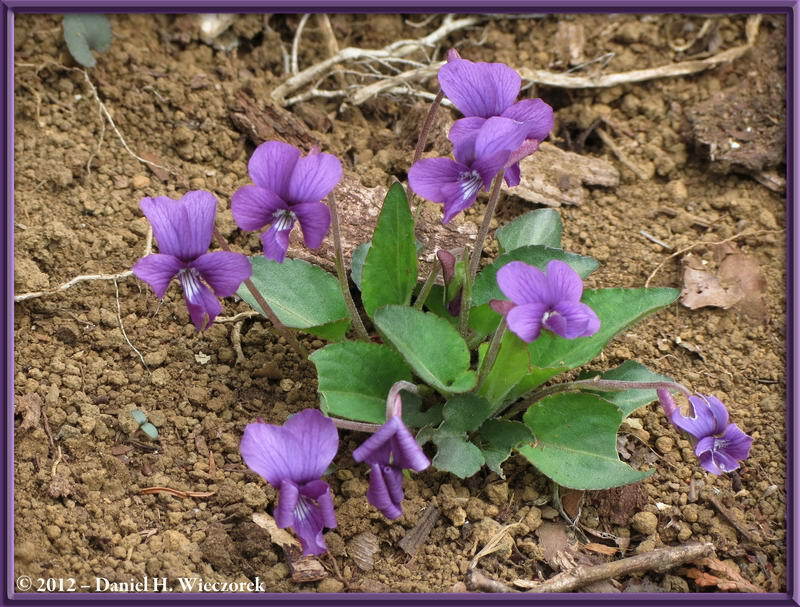 and the 3rd shot is a beautiful example of Viola phalacrocarpa f. glaberrima. 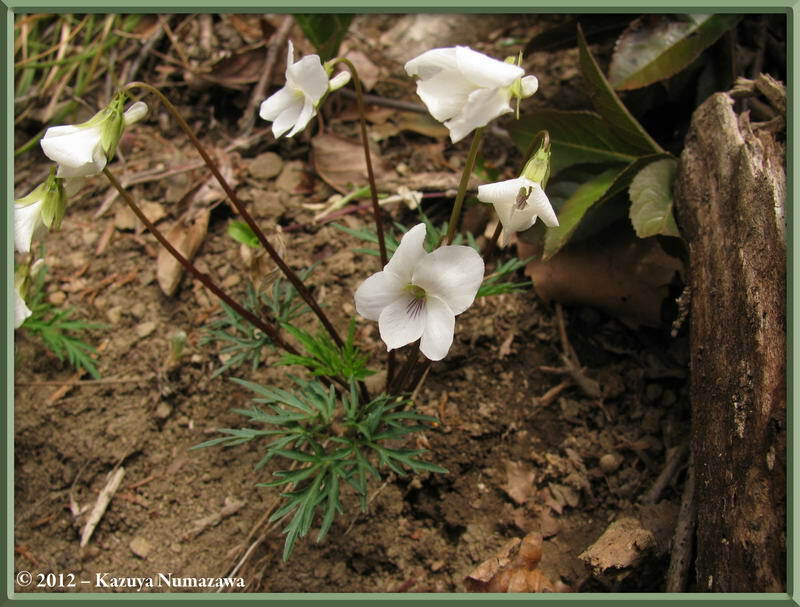 Note that the spelling of the photo name is INCORRECT - it should be glaberrima. 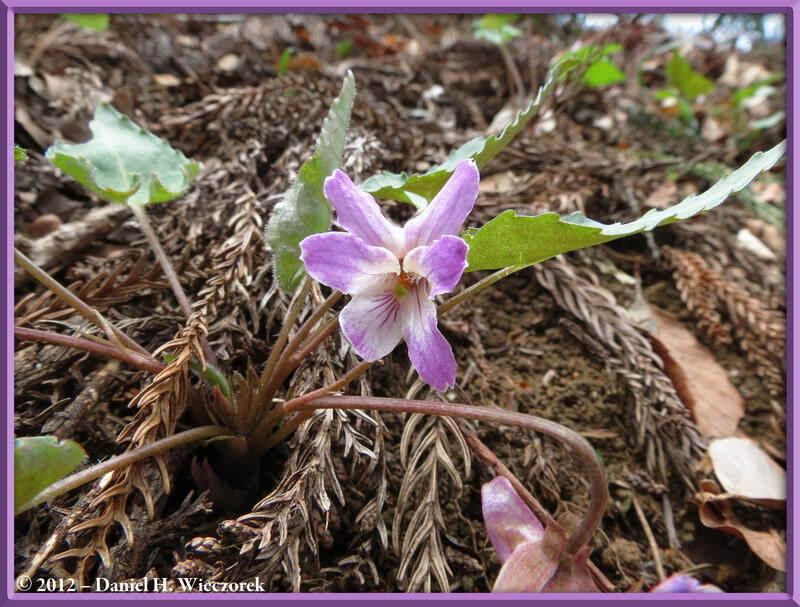 Here are 2 more shots of Viola phalacrocarpa f. glaberrima followed by a shot of Viola phalacrocarpa. What's the difference? 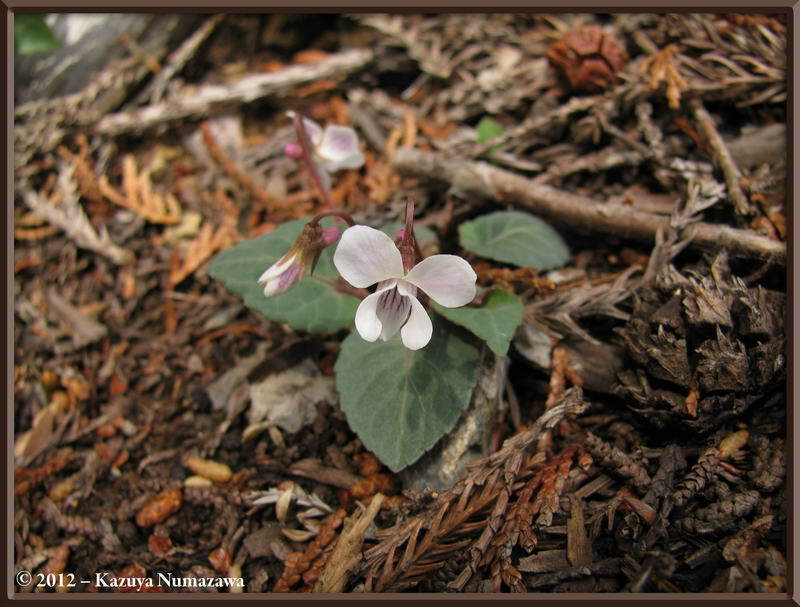 The flower stem of Viola phalacrocarpa f. glaberrima is not hairy and the flower stem of Viola phalacrocarpa is hairy. 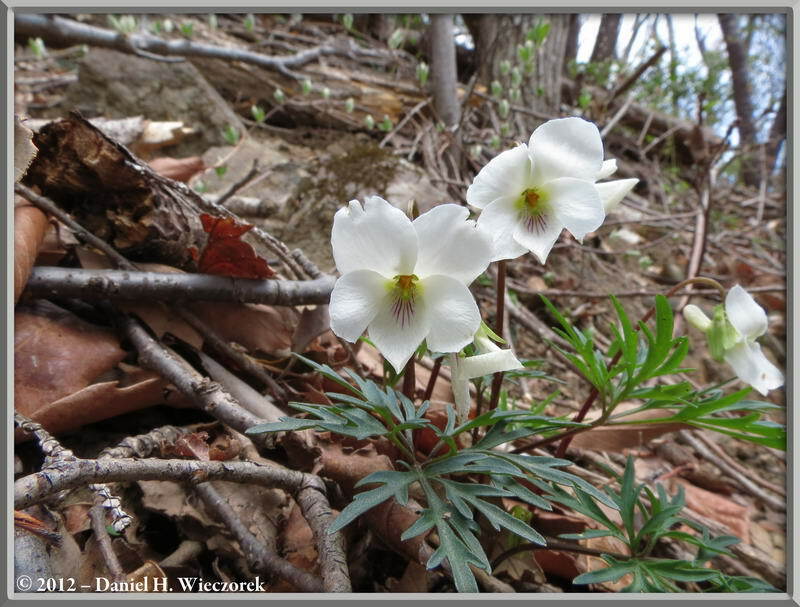 Here is an overview shot of Viola phalacrocarpa f. glaberrima showing the habitat where one can find it growing. 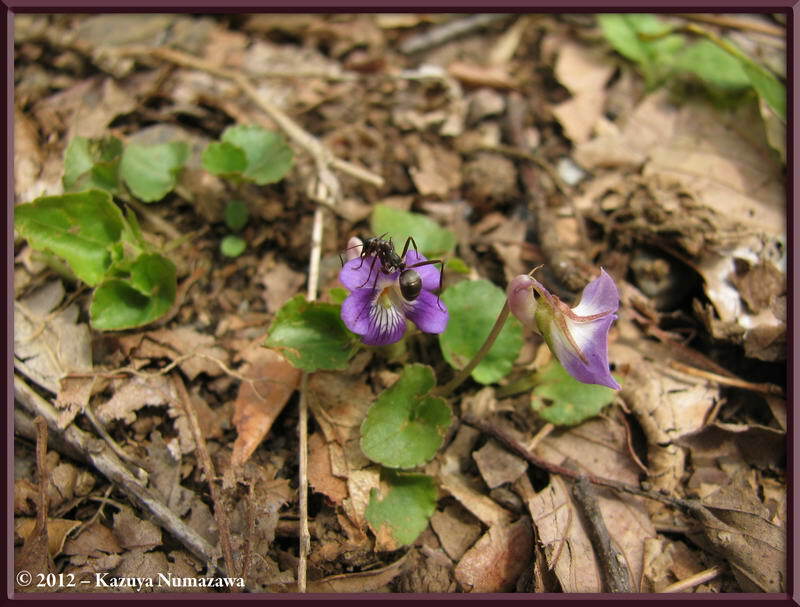 That is followed by a shot of a Viola obtusa with an ant crawling on it for scale and the 3rd shot is a Viola obtusa without an ant on it. What the heck is this thing? 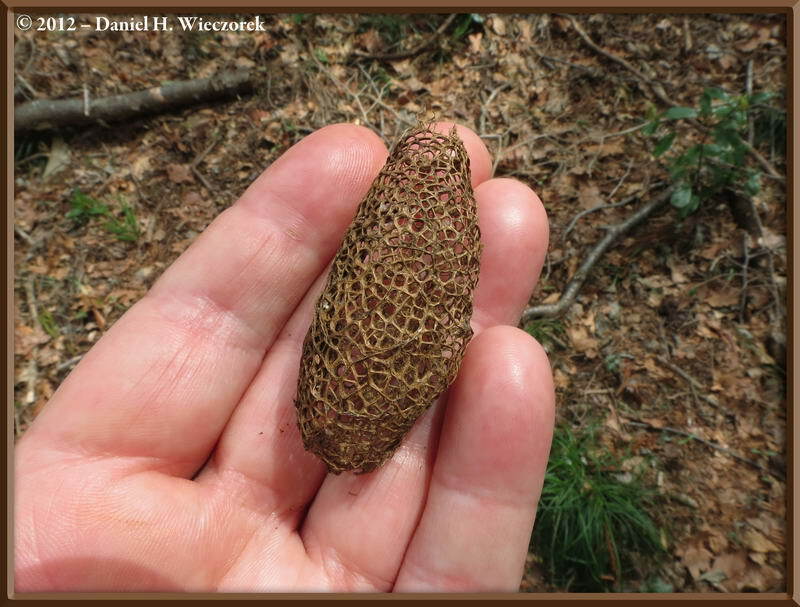 Is it some kind of cocoon or is it the seedpod of some plant? 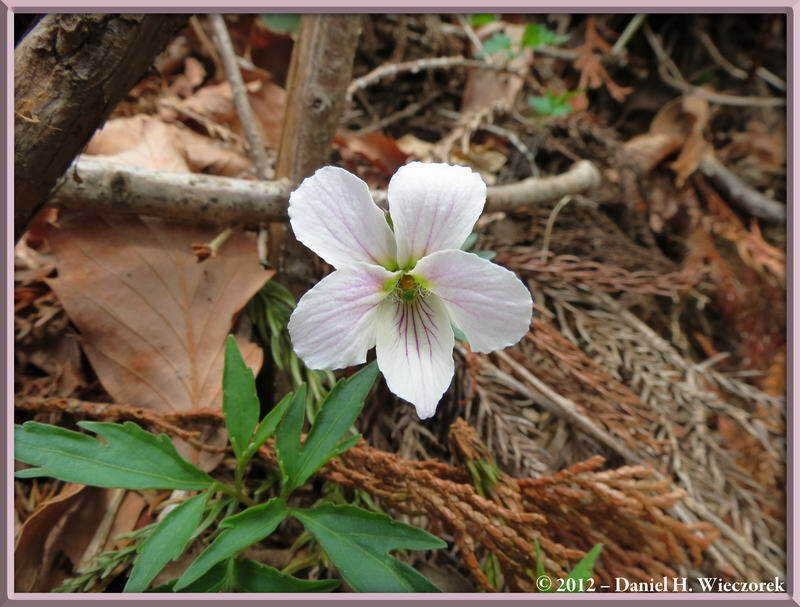 There were several of these things scattered here and there. 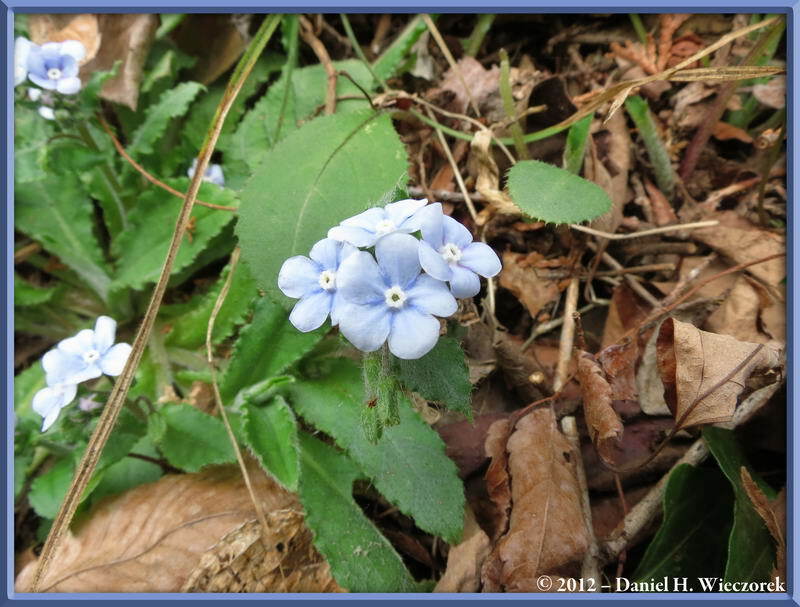 If you know what it is, please contact me through the e-mail link at the bottom of this page. 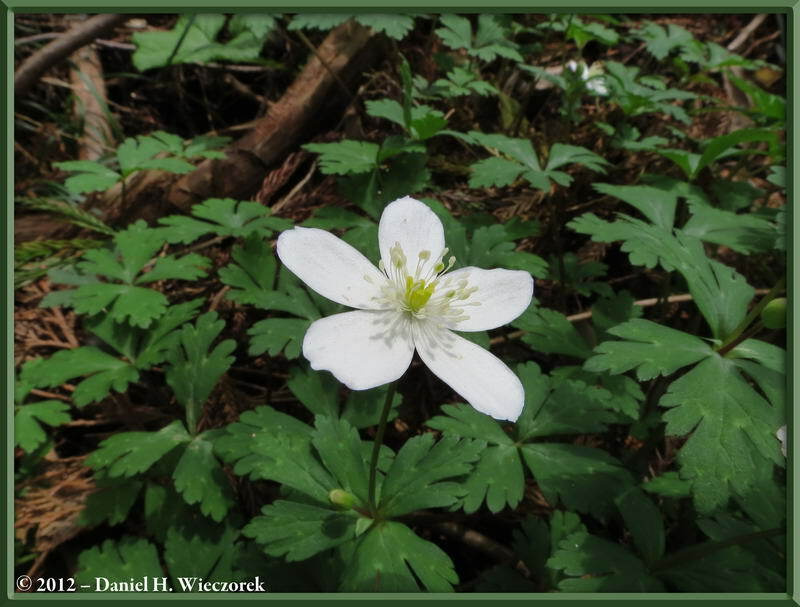 The 2nd and 3rd shots show a beautiful Anemone flaccida. 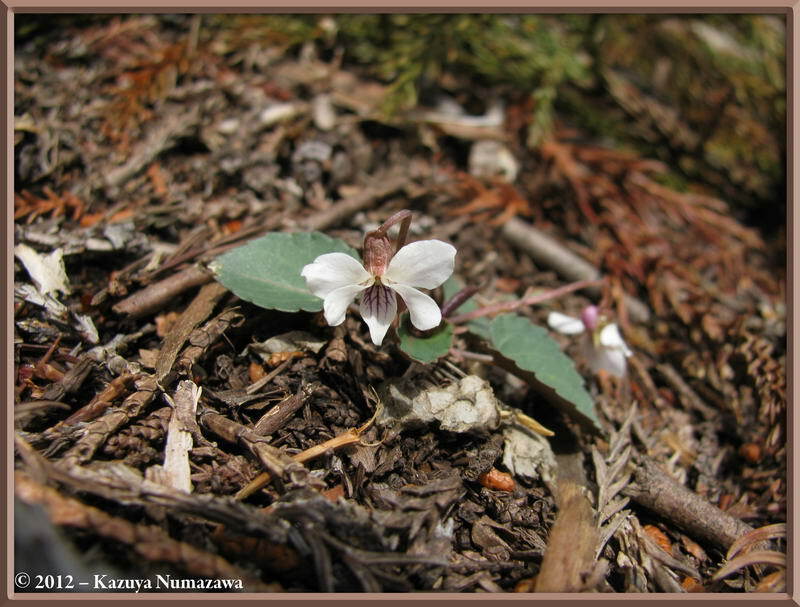 Here are two shots of Viola bissetii followed by a shot of Viola grypoceras. 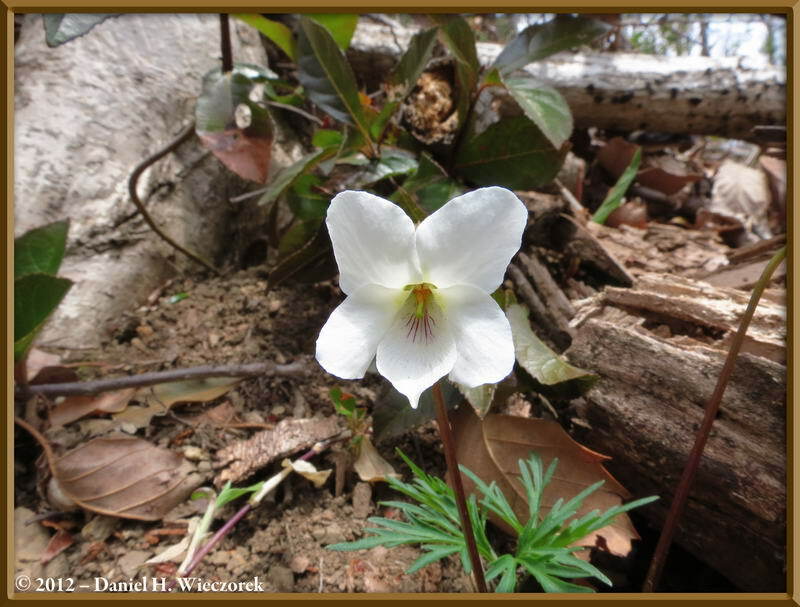 Here is a shot of a Viola phalacrocarpa (hairy flower stem). 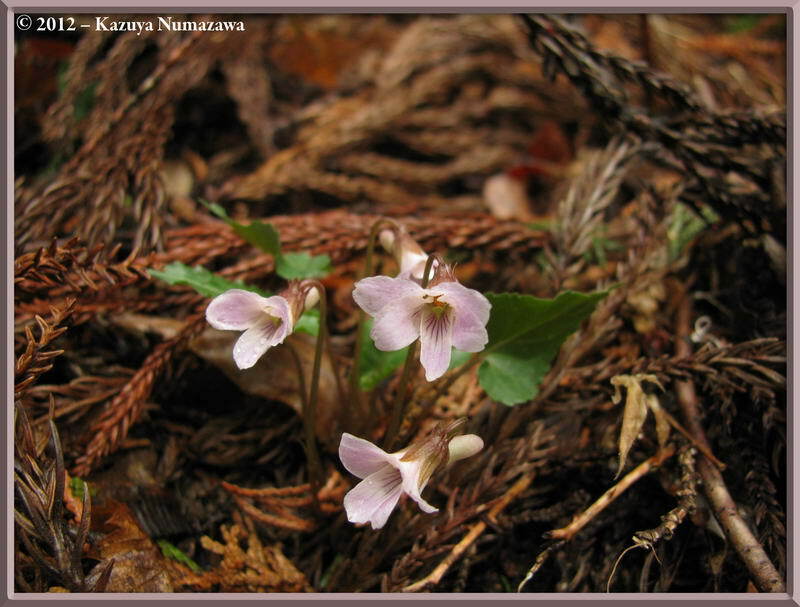 That is followed by a shot of a Viola tokubuchiana var. 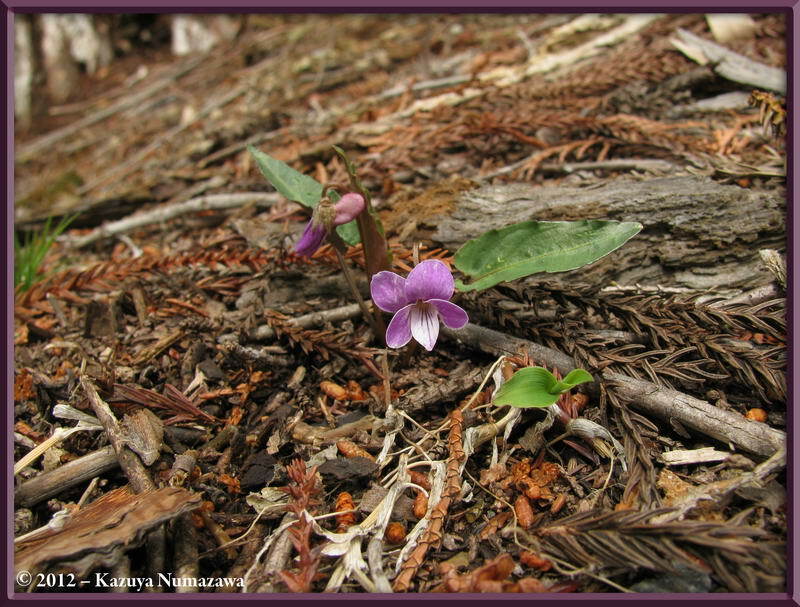 takedana and then a shot of a Viola eizanensis. 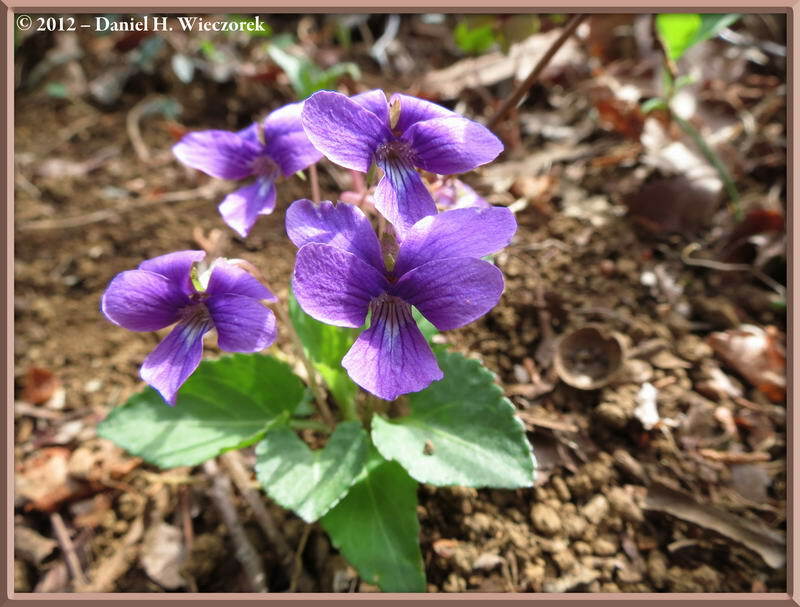 Here are 3 shots of a Viola chaerophylloides f. sieboldiana - this is a species which we seem to only find every couple of years, so we considered ourselves fortunate today to find this species. 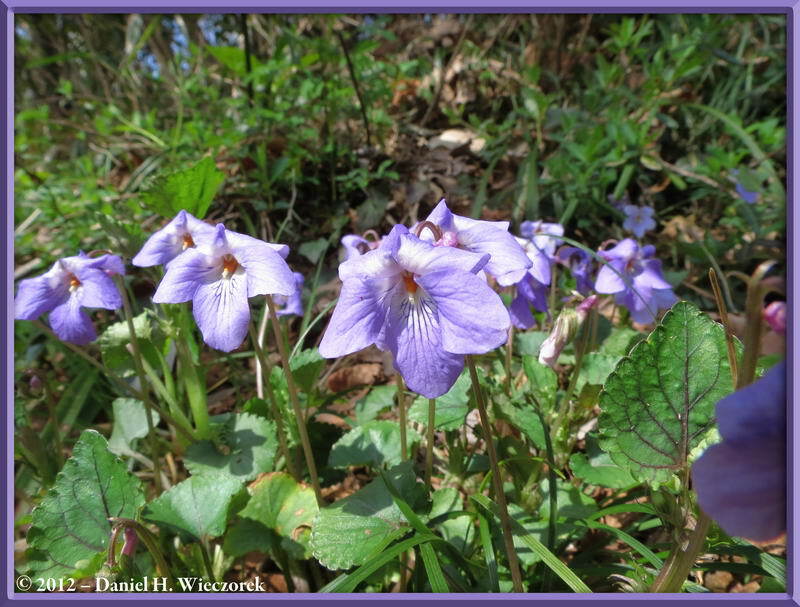 Here are 2 final shots of Viola chaerophylloides f. sieboldiana and that's followed by a shot from the place where we stopped and ate the lunch which we brought with us. 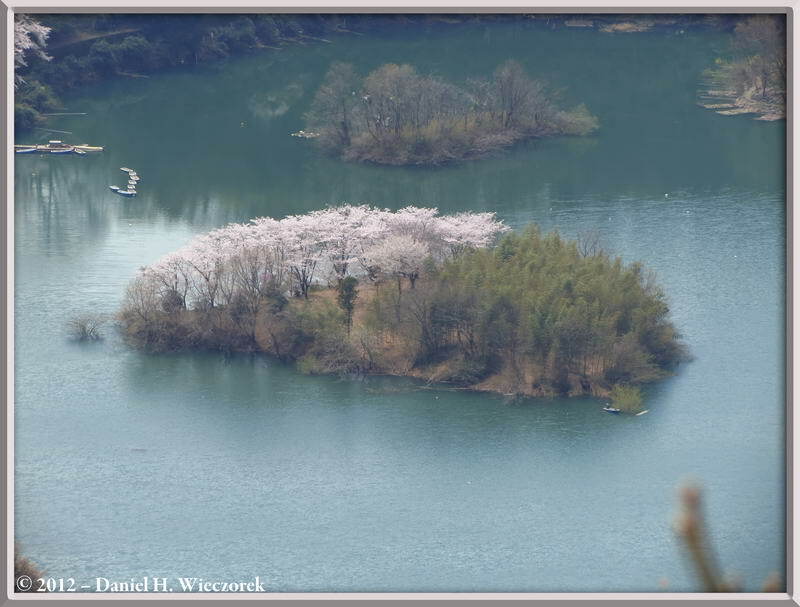 This is an island in Lake Tsukui. Notice that the Cherry Trees are in full bloom here. 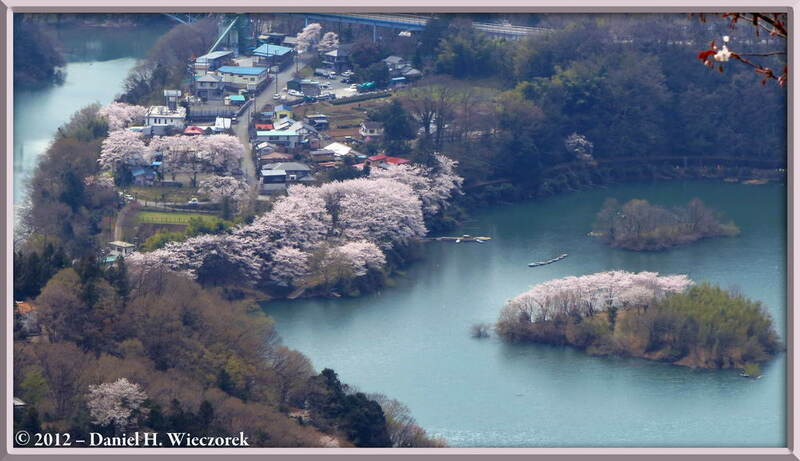 I set my camera to the 16 x 9 mode for this shot of Lake Tsukui (usually I use the 4 x 3 mode). 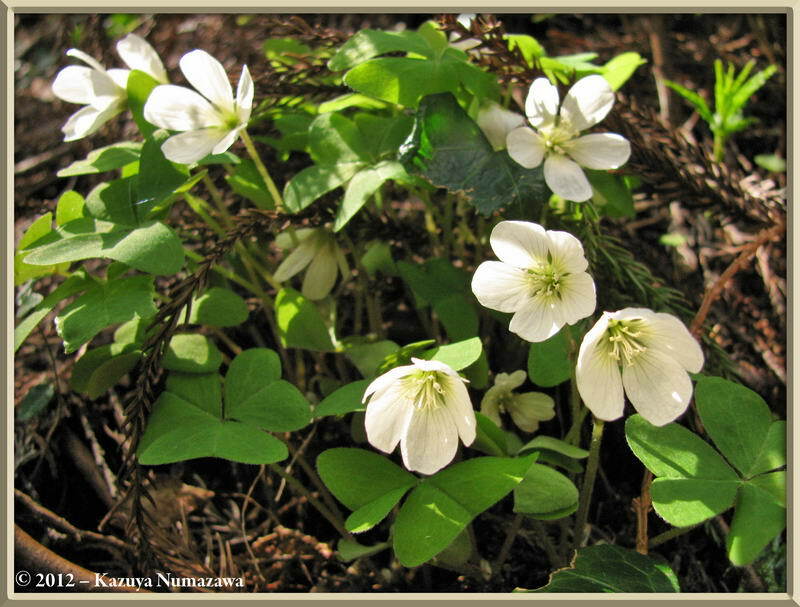 The next 2 shots are a great specimen of Oxalis griffithii var. kantoensis. 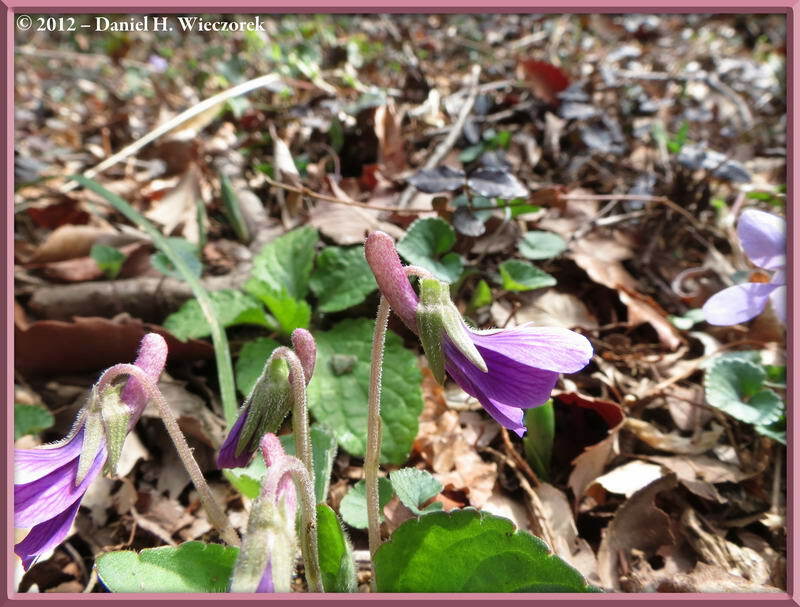 The sun has to be out to be able to see open flowers of this species. 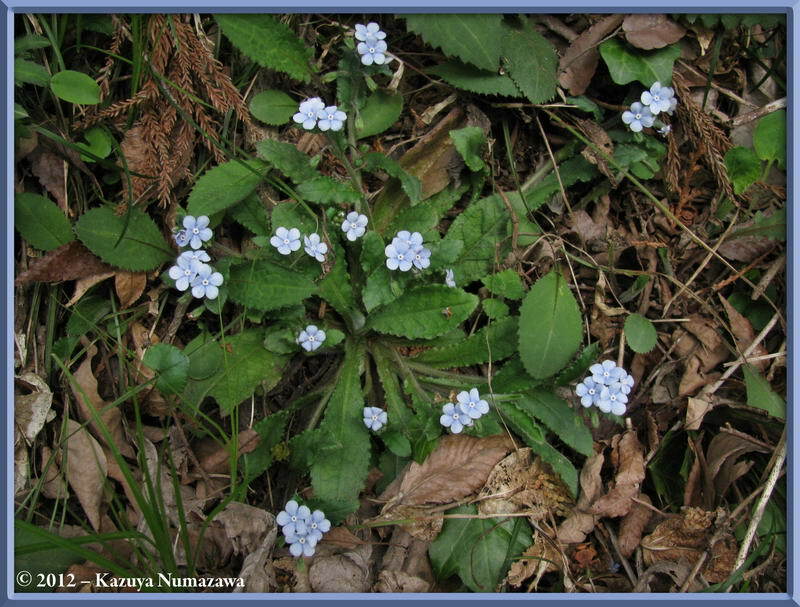 In this shot are 2 shots of Omphalodes japonica. 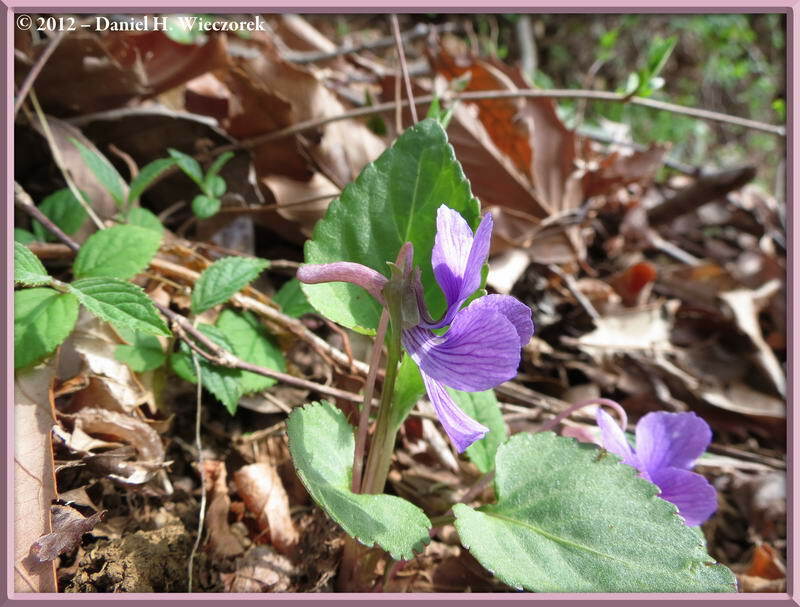 We found this species last month, but the photos we got were not good enough to feature it with last month's photos. 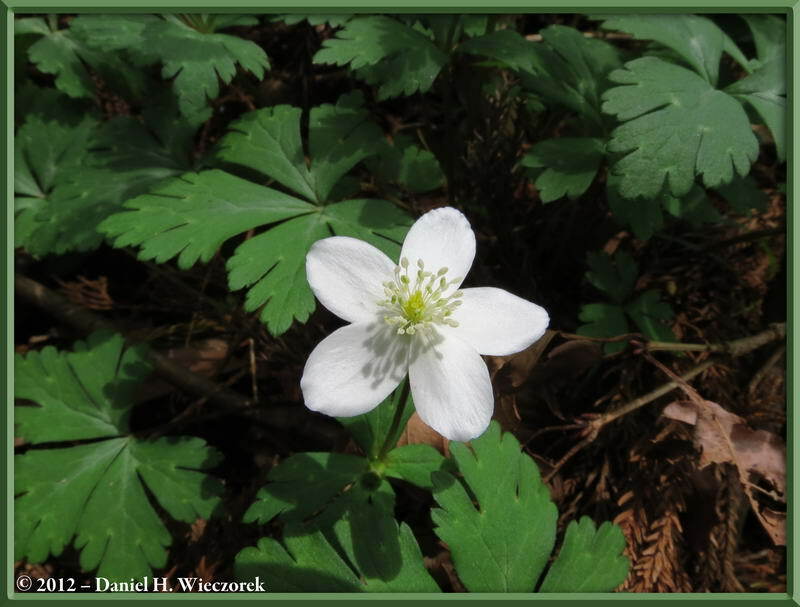 The 3rd shot shows the delicate green colors of early spring. 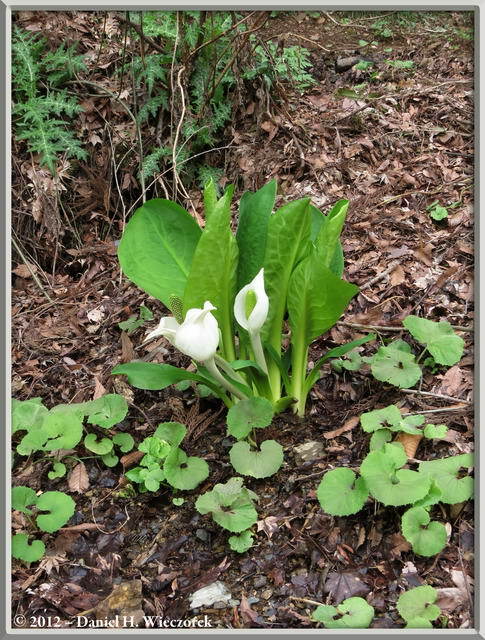 Here are 2 kinds of Skunk Cabbage - the white flowered Lysichiton camtschatcense and the purplish brown flowered Symplocarpus foetidus. 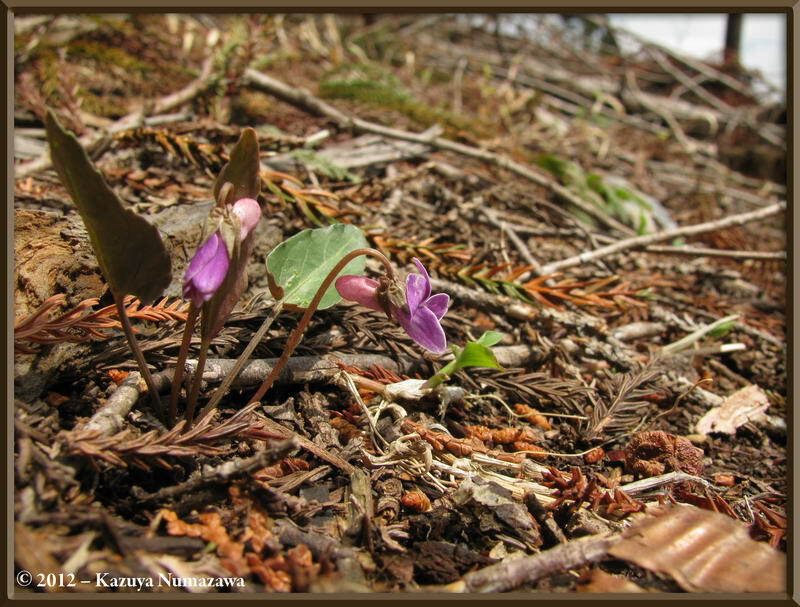 They are both in the Araceae family. 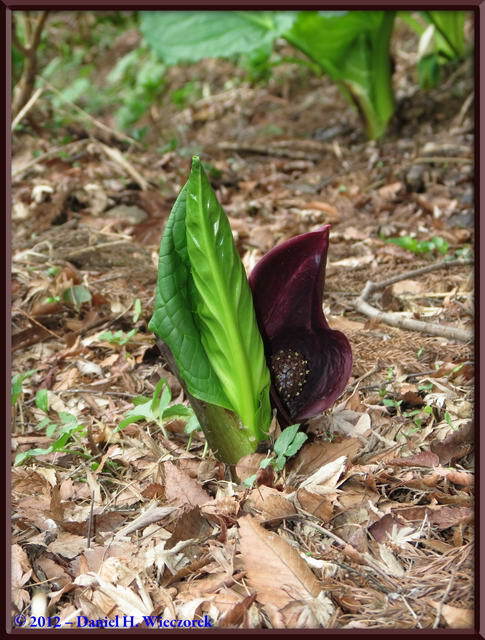 Arisaema (row #1 center position) is also in this family. On Sunday, April 15th I had to do class prep and pack my bag for a trip to Omika in Hitachi City in Ibaraki Prefecture for a week long intensive English Class. 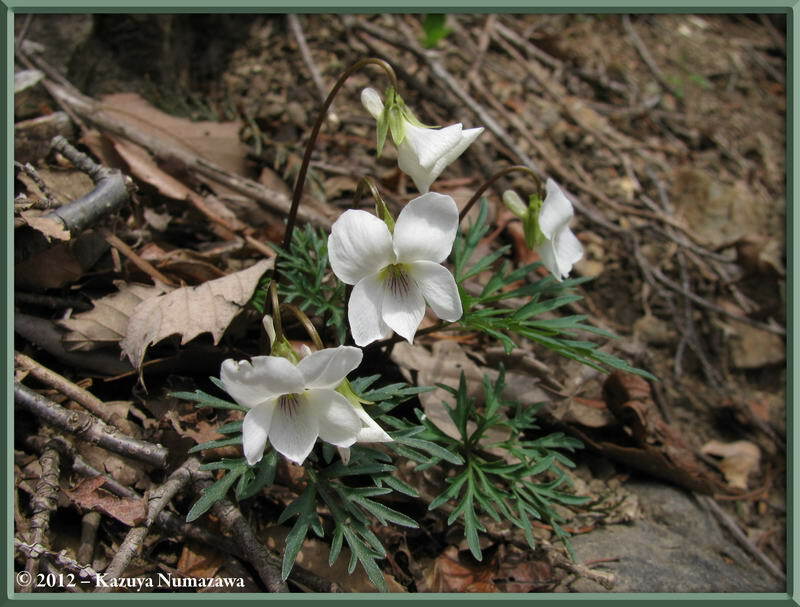 Kazuya went out to the Mitake Area for the day and here are some of his best shots from that adventure. 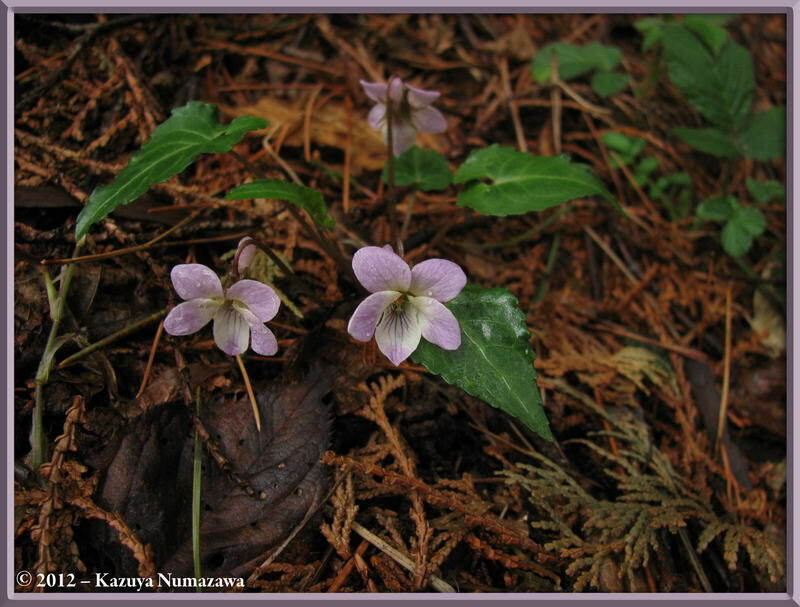 The first 2 shots show you Viola tokubuchiana var. 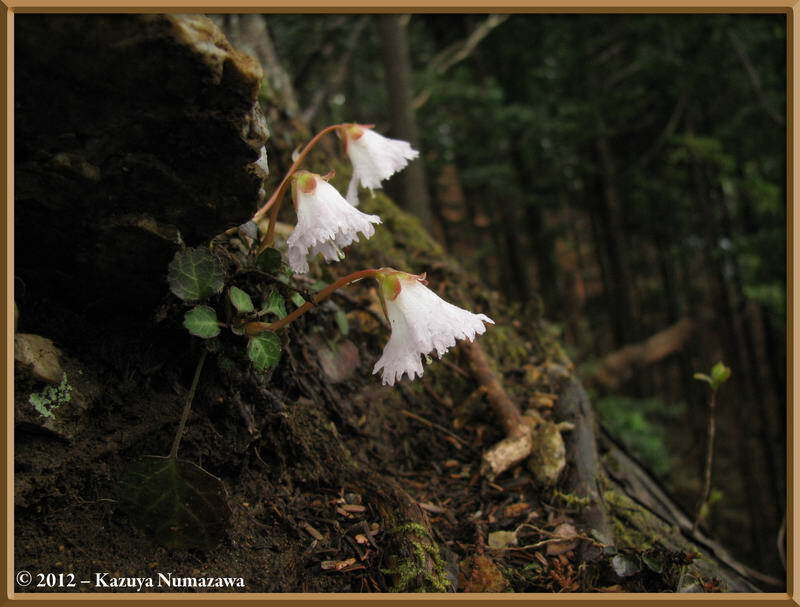 takedana and the 3rd shot is a Shortia uniflora. 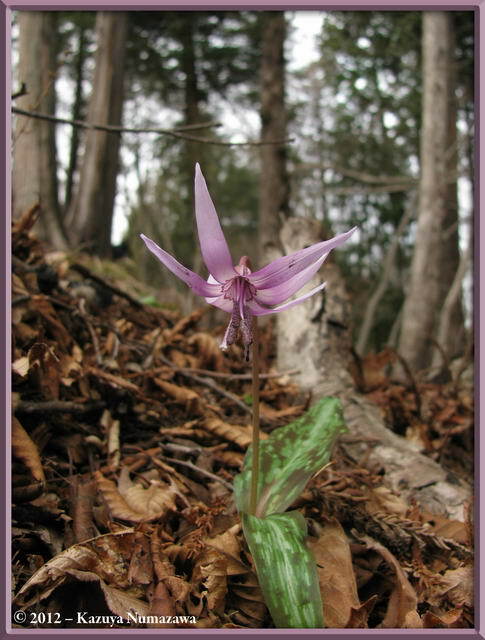 Here is a last shot of Shortia uniflora and then a Trout Lily (Erythronium japonicum). 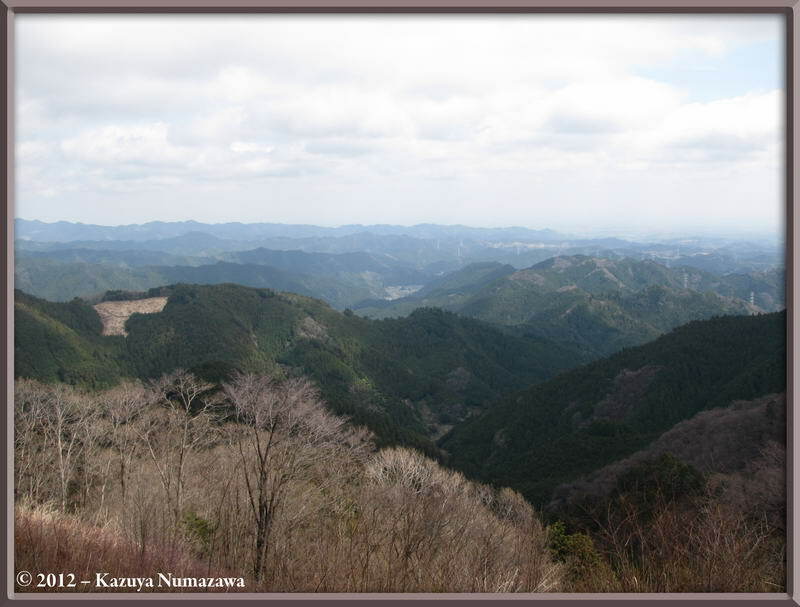 The 3rd shot is a Scenery shot from the top of a mountain Kazuya visited. 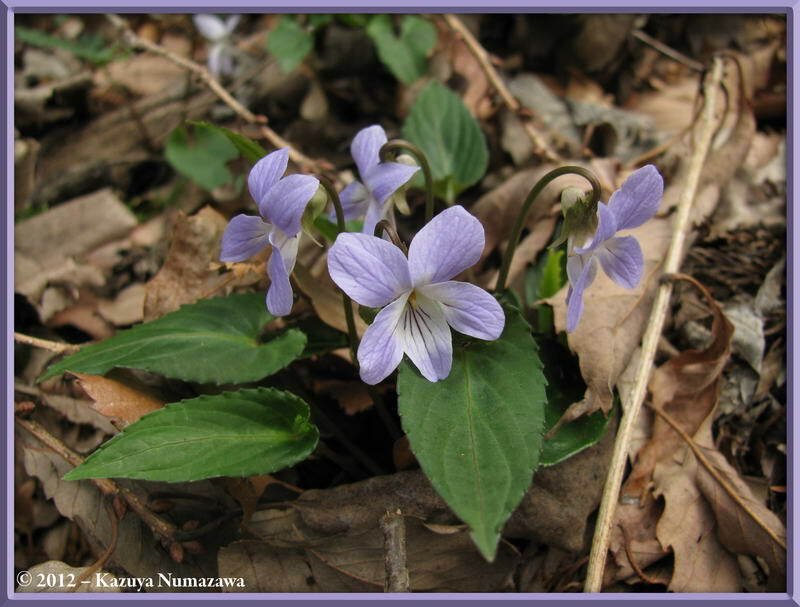 Kazuya was also fortunate enough to be able to find some Viola sieboldi and then in 3rd position a few Viola violacea var. makinoi. 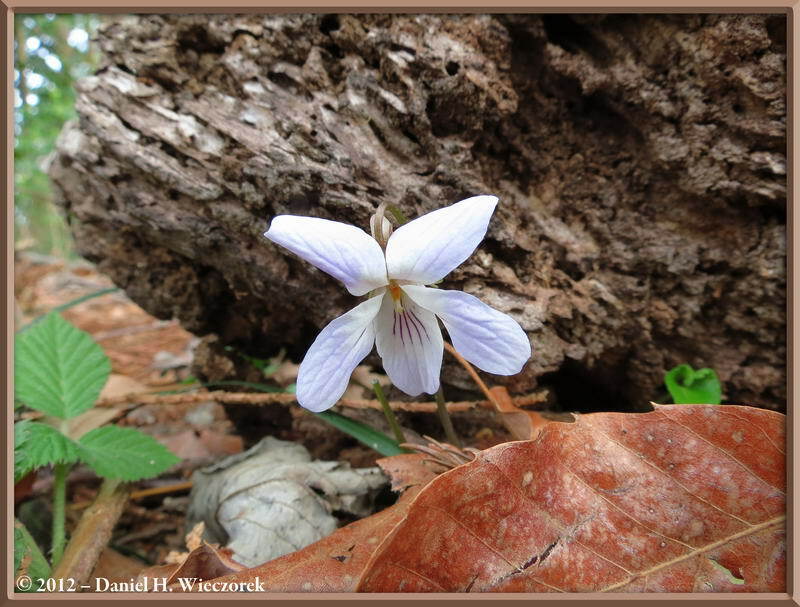 Here is another shot of Viola violacea var. makinoi and then 2 shots of Viola sieboldi. 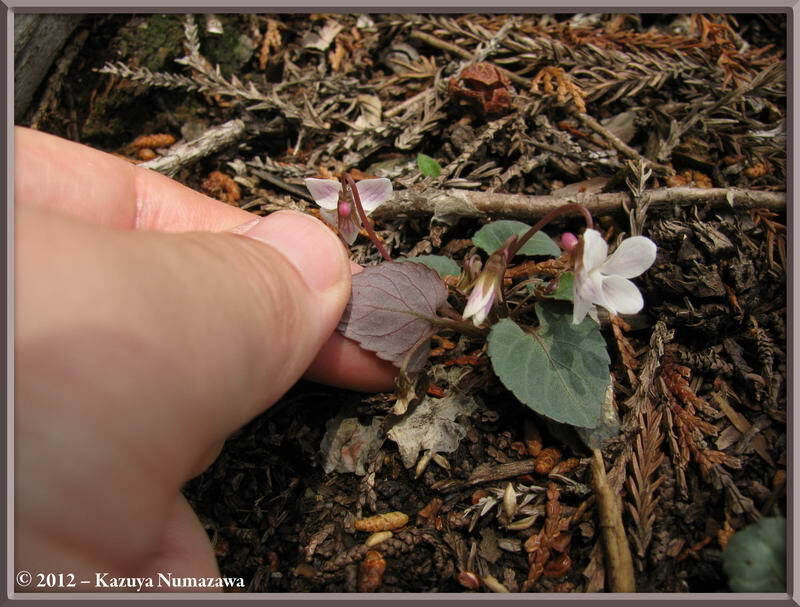 Here is a final shot of Viola sieboldi and then a nice shot of Cherry Blossoms at a temple which Kazuya passed. 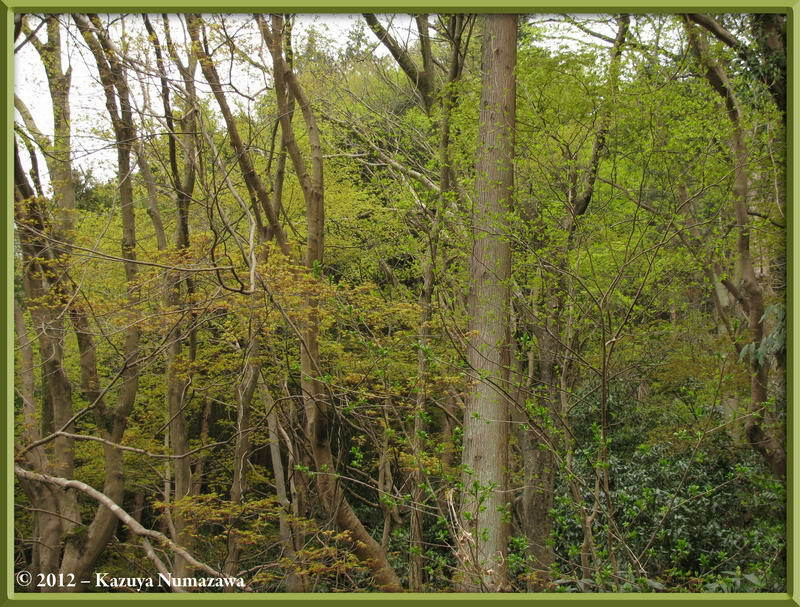 I was still in Hitachi City, Ibaraki Prefecture on Friday when Kazuya had a day off from work. 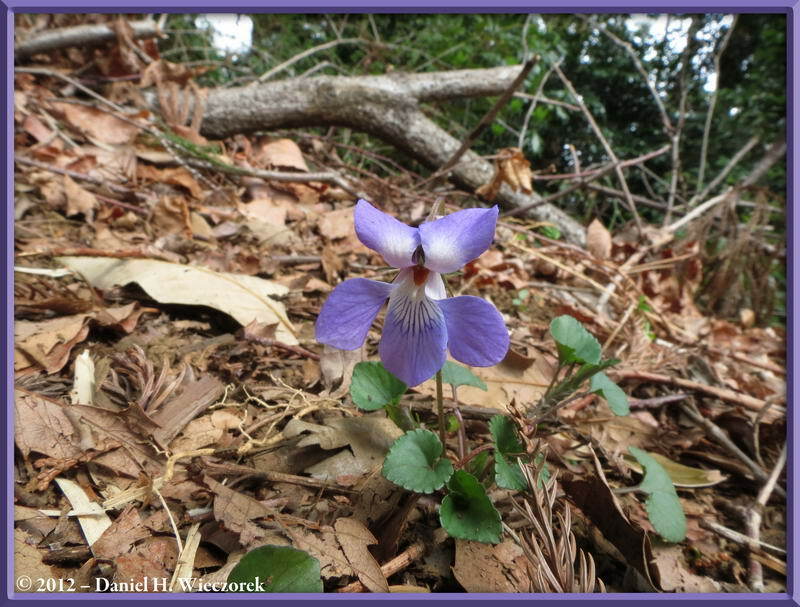 He went out to Fujino on the Chuo Train Line and climbed some mountains there. 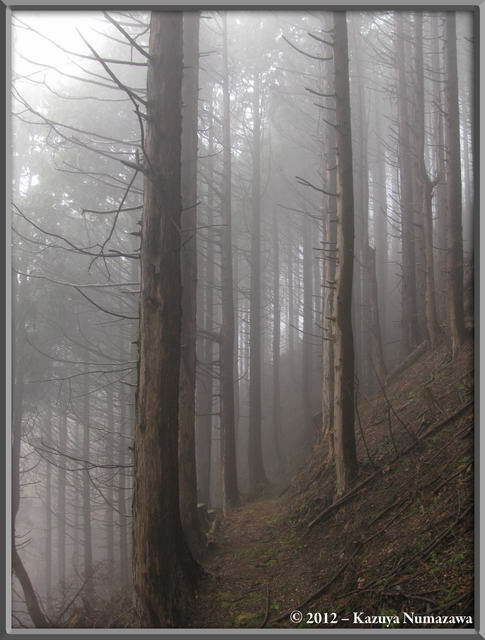 He reported that it was a cloudy or foggy day and that gave a mysterious effect to things. 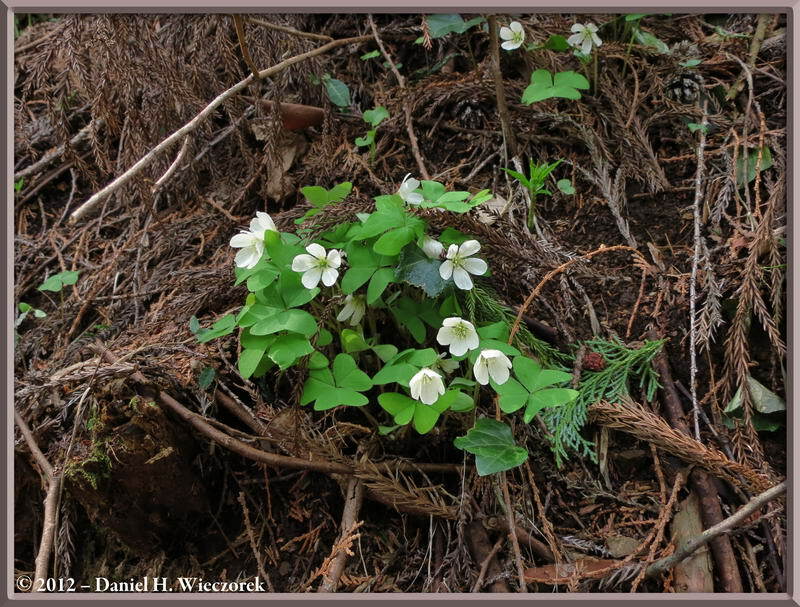 The first shot shows some delicate greens of spring. The 2nd shot shows the mysteriousness of the place. 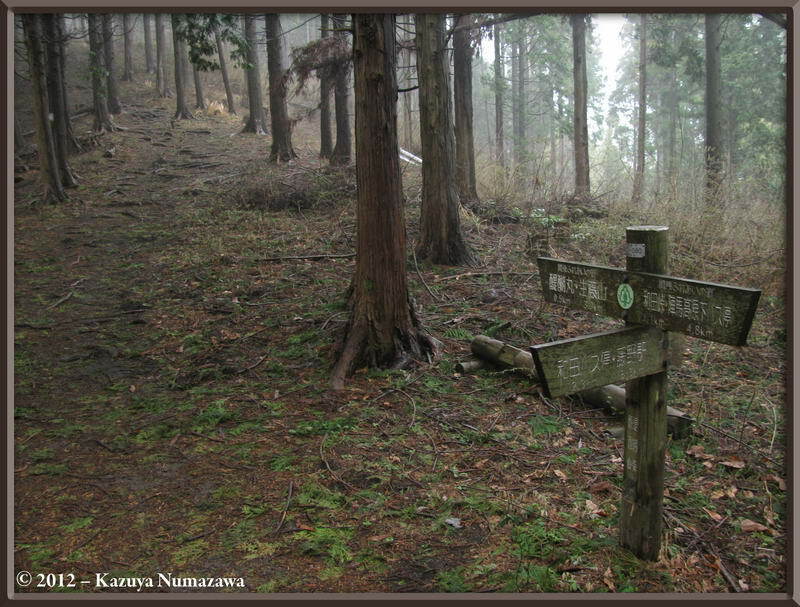 The 3rd shot indicates that the trails in this area are not what one would call over-used. 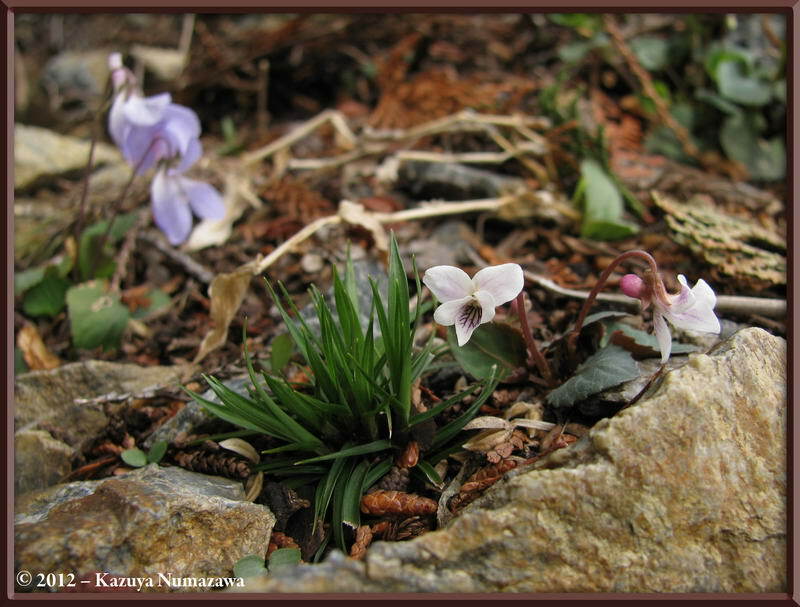 Here you can see a Viola eizanensis in first position. 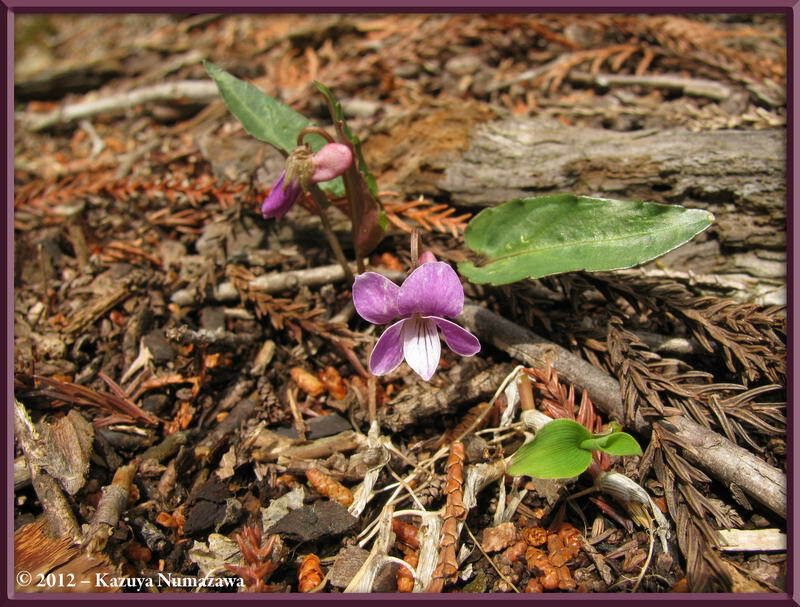 In 2nd position is a specimen of Viola tokubuchiana var. takedana. 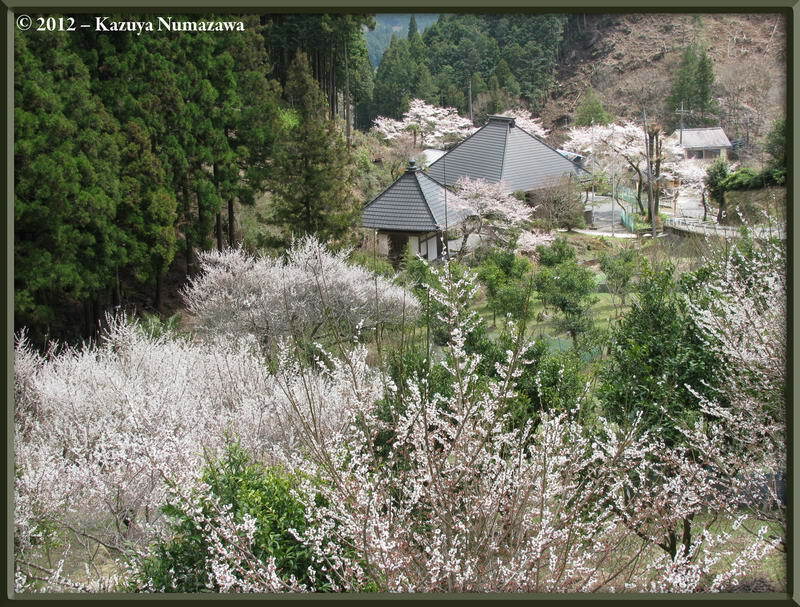 In 3rd position is a scenery shot - you should note the Cherry Trees blooming on the mountain.